Warning: this reviewer knows the author of this book. We have friends in common, we have belonged to the same organizations, we occasionally meet at parties. But decades before we met, Antonia Fraser, then still Antonia Pakenham, was an object of envy for a 1950s’ teenager who read about her in gossip columns. She seemed to have everything that a girl could want: she was clever, posh and pretty – even prettier when she became what in those days was called ‘a bottle blonde’. These memoirs show that Antonia really did have everything and know everyone. Almost every name mentioned in My History is a famous or an aristocratic one. Antonia was born in 1932, the eldest of eight children, and grew up in Oxford, where her father, Frank Pakenham, later the Earl of Longford, was a don. This book contains many affectionate accounts of his virtue and unworldliness. Antonia’s mother, born Elizabeth Harman, was equally remarkable. A committed political activist for the Labour party, she stood unsuccessfully for parliament, her activities never curtailed by pregnancy or by the demands of her four sons and four daughters. When it became obvious that she was not going to achieve a political career of her own she turned to writing biographies (Queen Victoria, The Duke of Wellington etc) and had to be firmly diverted from her plan to write about Mary Queen of Scots. Her daughter had already staked a claim to that one. After the Dragon came an unhappy year at boarding school in Salisbury followed by a happy one at a Catholic school, where Antonia was received into the Catholic Church. It meant a lot to her then and apparently still does now. Next, the gap year, the university years (Antonia was at Lady Margaret Hall in Oxford), the employment years, when her mother arranged for her to work at the publishers Weidenfeld and Nicolson, and marriage to Hugh Fraser, a dashing Scot who happened to be a Conservative MP. 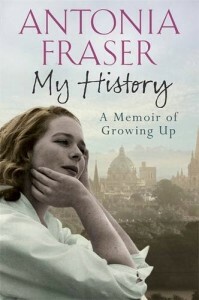 At last, in 1965, Antonia Fraser embarked on her real career and the work she had always wanted to do – writing History. Her first serious biography, a labour of love about Mary Queen of Scots, became a bestseller and was enjoyed both by professional historians and by the public. More biographies followed: Oliver Cromwell, Charles II, Marie Antoinette and others, and she also wrote a series of excellent crime novels. But those came later, as did the love of her life, Harold Pinter, about whom she wrote in Must You Go? My History covers the first third of its author’s life and Must You Go? the most recent years. I do hope the next volume is being written to fill the gap, for this interesting and enjoyable book has made me as curious about Antonia Fraser’s life as I was at the age of sixteen.